The demonstration featured improved multi-access user experience enabled by advanced virtualized network functions such as universal authentication, universal data path management and reactive content distribution. Also, distributed and centralized NG-POP scenarios have been illustrated, supported by an integrated wavelength-based optical infrastructure through an 18-km fibre ring around Lannion. This demo event fully reached its technical and dissemination objectives, with fruitful experimental results and about 40 external visitors. 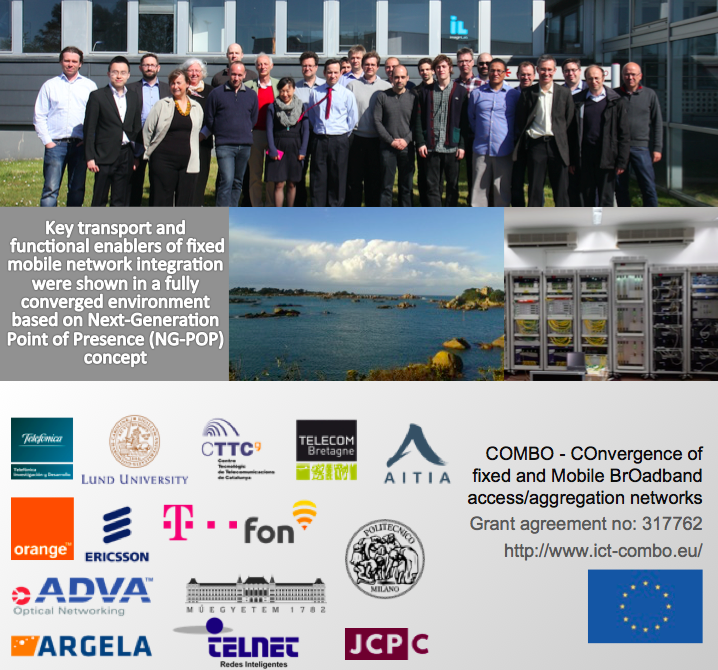 The various booths shown at this demo event have also been video-recorded, so as to allow further dissemination of COMBO experimental outcomes and vision on integration of fixed and mobile networks for 5G architecture. COMBO Architectural Concepts and Outcomes Architectural outcomes of COMBO project on both transport and functional aspects. Key project concepts are explained here: NG-POP, integration of backhaul/fronthaul with fixed access, Universal Access Gateway, universal Authentication, universal Data Path Management!